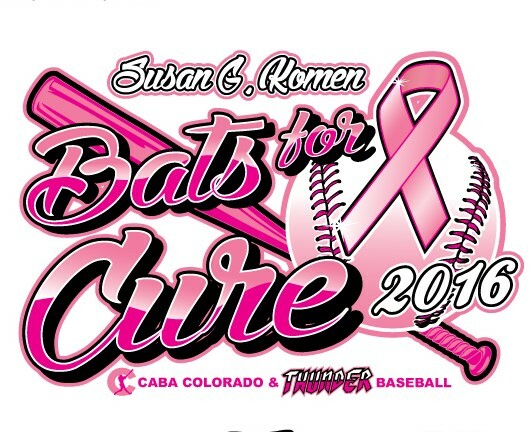 “Bats for a Cure” Tournament"
Thunder Baseball League is hosting a CABA Colorado Baseball Tournament in Broomfield, Colorado June 3-5, 2016. $10 of all entry fees, $5 from all commemorative pink and black TBL hat/visor sales, and $5 from every custom tournament shirt sale will be donated to Susan G. Komen Colorado. Arrive early, register your team, pick up your bucket, and enjoy dinner Sponsored by Noodles & Company starting at 5:45pm. Not required, but highly recommended if you are hungry. We will set expectations for the weekend. Salon Karma will be giving buzz cuts and painting hair pink. Bring your kids to the Jumpy Castle, sponsored by Rogue Wave Software. Visit www.thunder-baseball.org for more information.